Are you ready to jump into learning more about personalized learning? 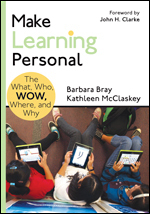 I am excited to be part of your journey as you read Make Learning Personal over the next few weeks. I will join you at a regular time as you are completing each chapter with a live 1-hour webinar. This is when you can ask me questions about the ideas in the chapter. Sometimes I will ask you questions for you to think deeper about what you just learned. The most important thing is that you will be having conversations about personalized learning; what it is and what it is not, understanding who your learners are, how teacher and learners roles change, where personalized learning is happening, and the ultimate question: Why Personalize Learning? The Goal of the MLP Virtual Book Study: To build a common language and understanding around personalized learning.